The Nespresso Naora website is really interesting; it is a great example of an immersive online experience. When you go onto the page, it instantly has things like moving images and zooms through the different parts of the page. Type appears and fades away. Once on it is set out so viewers can have more then one way to navigate around the page. For instance, through a scroll system or call buttons and through the banner. This website allows users to follow the information in both linear and a none linear way. There are also personalised settings like to change the language of the site, mute sounds and even outer pages to go shopping for brand items. The page tells a story of what the product is, where it is produced, how long the process takes. There’s sounds, videos and images all over the site. Just giving out all the information people may want to know or may find interesting. The fonts used are really simple and easy to read this is a bonus to the site as it allows ease and for individuals to digest the information embedded within the site. The colours are bright, and create the ideas of a luxury brand which people will buy into. All of the different elements make this site really enjoyable for the viewers. Snowfall is a really interesting site, it is done in a long form format. This means that there is lots of text. To break it up what the site has done is include, social media links, videos, photos, sound clips and moving images. The writing is in a really simple but affective font. It allows people to take in the mass of the text. The key interactive parts of the site really immerse the viewers as it keeps them seeing something new. The images give the content a humanised feel and draws people in. The banner is great as it allows you to embed information elsewhere, on social media, emails etc. Also a chance to change language to your personal preferences. I also allows viewers to move in a none linear away and skip parts they may not be interested in. The colour scheme is basic but matches the content. The website really tells a story. This website is my favourite of the websites I looked at. It is so immersive and gripping. The content tells the story of people who survived the holocaust. There are lots of different interactive elements on the site like hover over buttons, call buttons, Maps, sound clips, video, many images and key text. The best part of the website is the ‘Walk Among Memories’ it uses ‘Google Maps’ to show viewers the different places of where the camps where and where the guards stayed etc. When you find a specific area in the map image appears along with text and audio this adds more dimension to the website as it tells a story about the heritage and history. I think the colour scheme added tension with bold red and dark greys. It told the viewer this was a dark period in history. This site really pulled at the heartstrings as the imagery humanises the content and makes you feel like that could be someone you know. This is a health and fitness website. I personally believe that the design is very simple but gives the viewers a good immersive experience as it is clean having navigation and screen changes. Small amounts of information on the home page is useful as people read differently on a website.It allow people to buy fitness product and call buttons and pull down bars make the buying process simple. Also there are a wide range of hover over buttons. This is generally an image and if you hover over text will appear. This would appeal to a much more niche target audience with it being health and fitness and a buying site. The last website I chose was Qbit technologies. According to the website Qbit is an Innovation Lab that focuses in creating links between research on new technologies and businesses. They Specialise in Virtual Reality, 3D Immersive Experiences, 3D Training Simulations, 3D Serious Games, Virtual Assistants, Virtual Worlds and Immersive Technologies in general. There is so much going on in the site, for instance, it has symbols, images, virtual gaming aspects, videos, maps, sound clips, hovering buttons and much more. This would appeal to a specific audience like the last website I spoke about, this is because gaming is not for everyone. The language reflects this with using gaming language that you wouldn’t necessarily know otherwise. 18 amazing facts about Malala Yousafzai to celebrate her 18th birthday (2015) Available at: http://www.mtv.com.au/malala-yousafzai/news/18-amazing-facts-about-malala-yousafzai-to-celebrate-her-18th-birthday (Accessed: 9 April 2016). 6, M.D.K. (2016) ‘Muhammad Danish khan – Google+’. Interview with . ABC News (2013) Malala Yousafzai, 16, and her miraculous story of surviving being shot by the Taliban. Available at: https://youtu.be/CXvs1vwiD0M . Ashish Thomas, E. and Narain Shukul, R. (2015) ‘Framing of Malala Yousafzai: A comparative analysis of news coverage in western and Pakistani mainstream English print and alternative media’, Media Asia, 42(3-4), pp. 225–241. doi: 10.1080/01296612.2016.1142248. Associated Press (2013) Malala wows crowd at annual glamour women of the year awards. Available at: http://www.foxnews.com/entertainment/2013/11/12/malala-wows-crowd-at-annual-glamour-women-year-awards/ (Accessed: 9 April 2016). Audiobooksnow.com (no date) Available at: https://static.audiobooksnow.com/jackets/jackets/small/7/9/1/9781478979791.jpg (Accessed: 9 April 2016). BBC (2012) Malala Yousafzai: Portrait of the girl blogger. Available at: http://www.bbc.co.uk/news/magazine-19899540 (Accessed: 9 April 2016). Blog, M. (2013) Malala Yousafzai full diary for BBC (Gul Makai). Available at: http://www.malala-yousafzai.com/2012/10/Malala-Diary-for-BBC.html (Accessed: 9 April 2016). Brumfield, B. (2013) Malala’s journey from near death to recovery. Available at: http://edition.cnn.com/2012/11/10/world/asia/pakistan-malala-one-month/index.html (Accessed: 9 April 2016). Comedy Central (2013) The daily show – Malala Yousafzai extended interview. Available at: https://youtu.be/gjGL6YY6oMs . Editorial (2014) Malala Yousafzai: All you want to know about the 2014 Nobel peace prize winner. Available at: http://www.india.com/top-n/malala-yousafzai-all-you-want-to-know-about-the-2014-nobel-peace-prize-169363/ (Accessed: 6 April 2016). France-Presse, A. (2014) Malala Yousafzai nominated for ‘children’s Nobel’. Available at: http://www.ndtv.com/world-news/malala-yousafzai-nominated-for-childrens-nobel-549922 (Accessed: 9 April 2016). Gabrielle, K.S. (2014) ‘The Dominican approaches in education’, . doi: 10.2307/j.ctt163t8vb. Glamour.com (no date) Available at: http://media.glamour.com/photos/56959ed093ef4b09520d8df5/master/w_743,c_limit/inspired-2013-10-malala-yousafzai-2-main.jpg (Accessed: 9 April 2016). Guggenheim, D. (2015) He named me Malala. .
Henry, Z. (2014) 5 inspiring quotes from Nobel-Winner Malala Yousafzai. Available at: http://www.inc.com/zoe-henry/5-inspiring-quotes-from-nobel-winner-malala-yousafzai.html (Accessed: 9 April 2016). Leive, C., Schallon, L., Gugliemetti, P., Kramer, J., Matera, A., Weiss, S. and Angelo, M. (2014) Malala Yousafzai is a 2013 glamour woman of the year; join us as we support her mission to make school a basic right for every girl. Available at: http://www.glamour.com/inspired/2013/10/malala-yousafzai-is-this-year-s-glamour-women-of-the-year-fund-honoree (Accessed: 6 April 2016). The New York Times (2012) Malala Yousafzai story: The Pakistani girl shot in Taliban attack | the New York times. Available at: https://youtu.be/9F5yeW6XFZk . 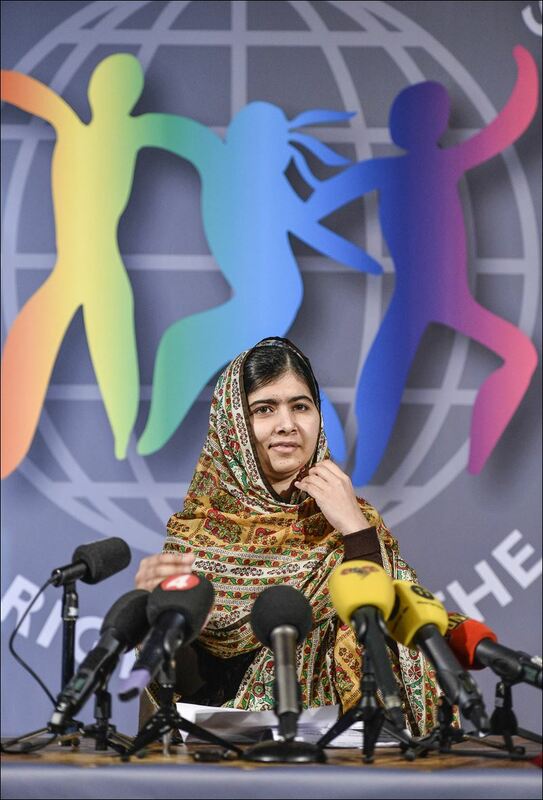 The New York Times (2013) Malala Yousafzai UN speech: Girl shot in attack by Taliban gives address | the New York times. Available at: https://www.youtube.com/watch?v=5SClmL43dTo (Accessed: 9 April 2016). Toledo blade.com (no date) Available at: http://www.toledoblade.com/image/2014/10/30/800x_b1_cCM_z_cB/Sweden-World-s-Children-s-Prize.jpg (Accessed: 9 April 2016). 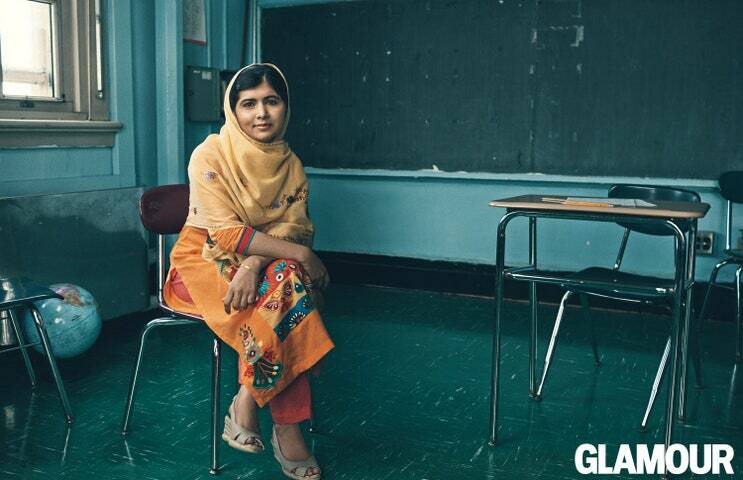 Van Gilder Cooke, S. (2012) Pakistani heroine: How Malala Yousafzai emerged from anonymity | TIME.com. Available at: http://world.time.com/2012/10/23/pakistani-heroine-how-malala-yousafzai-emerged-from-anonymity/#ixzz2YYXKTV4x (Accessed: 6 April 2016). Yousafzai, M. (2015) I am malala: The girl who stood up for education and was shot by the taliban. United States: Back Bay Books Little Brn. Yousafzai, M. and McCormick, P. (2015) I am Malala: How One girl stood up for education and changed the world. United Kingdom: Indigo (an Imprint of Orion Children’s). (no date) Available at: http://Henry,Z. (2014). 5 Inspiring Quotes From Nobel-Winner Malala Yousafzai. Available: http://www.inc.com/zoe-henry/5-inspiring-quotes-from-nobel-winner-malala&#8230;. Last accessed 11th October 2014 (Accessed: 9 April 2016).